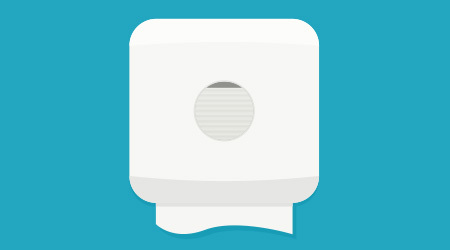 Part two of this three-part article details the specifics of ADA compliant soap and towel dispensers, as well as hand dryers. The first step for a jan/san distributor to become acclimated with the ADA is to simply read the law. A distributor should have its representatives download and read Section 300 of the 2010 ADA Standards for Accessible Design, experts say. This section describes clear floor space and reach range requirements, two essential elements of ADA compliance in restrooms. These requirements dictate how far dispensers, dryers and trash cans may protrude out into the open and how high the dispensers should be set on the wall, according to Ben Walker, a cleaning consultant with ManageMen, a firm in Salt Lake City. One of the basic ADA rules is that fixtures such as dispensers and hand dryers cannot protrude more than 4 inches from the wall if they are mounted between 27 and 80 inches above the floor, says Stein. Another rule is that the highest allowed height of the dispenser’s operating control is 48 inches off the floor in order to be ADA compliant. Noncompliance regarding the height of a dispenser typically occurs when it is placed above trim or wall finish in an effort to avoid having to refinish the wall, she says. “Having a basic understanding of clear floor space and reach ranges I think can go a long way to providing acceptable solutions for the maintenance and upkeep of restrooms,” says Lee Swinscoe an ADA expert and consulting manager at Universal Designers and Consultants in Silver Spring, Maryland. In general, jan/san distributor sales representatives only need to focus on permanent fixtures in a restroom for ADA compliance, according to Stein. “If you turn the room upside down, whatever did not fall is covered,” she says. Understanding dispenser operation is the next step for jan/san distributors. The ADA requires that soap, towel and sanitary napkin dispensers can be operated with a closed fist or an open hand rather than a tight grasp or twisting of the wrist that is sometimes required with knobs. Distributors can help by providing their customers with stickers that advertise ADA compliance that can be placed on the compliant dispensers. Distributors should also understand the ADA-required quantities of soap dispensers, towel dispensers and hand dryers. If a facility has one or more non-ADA-compliant unit (soap dispenser, towel dispenser or hand dryer), it must also have an ADA-compliant unit of the same type. For example, if a facility has two non-ADA-compliant towel dispensers, it must also have at least one ADA-compliant towel dispenser. Since the non-ADA-compliant dispensers were for towels, the ADA-compliant dispenser must also be a towel dispenser. “If you have paper towels and hand dryers, just because you have that paper towel (dispenser) at the accessible reach range, you also need to have at least one hand dryer at an accessible level, because it is one of each type with dispensers even though both of them are performing the same function,” says Swinscoe. Additionally, distributors must know the basic elements of their state and, in some cases, local laws that dictate accessibility. For example, distributors in Florida should understand that the state requires a lavatory — a wash basin, counter and dispensers — inside every ADA-accessible stall. However, that ADA-accessible stall is treated as if it were a separate restroom unit, which means the facility must still adhere to ADA guidelines for the dispensers in the remainder of the restroom. “So if you’ve got a paper towel dispenser and a soap dispenser inside that stall for that lavatory, they need to be at an accessible height, as well as paper towel and soap dispensers outside that stall that are provided in the main area,” says Swinscoe.